This Spicy Cranberry Salsa recipe is a mouthwatering addition to your holiday spread. It takes minutes to make and is the perfect combination of spicy and sweet! It’s officially party season and that, my friends, is my favorite time of year. When else is it totally socially acceptable, even expected, to have appetizers count as a full meal? 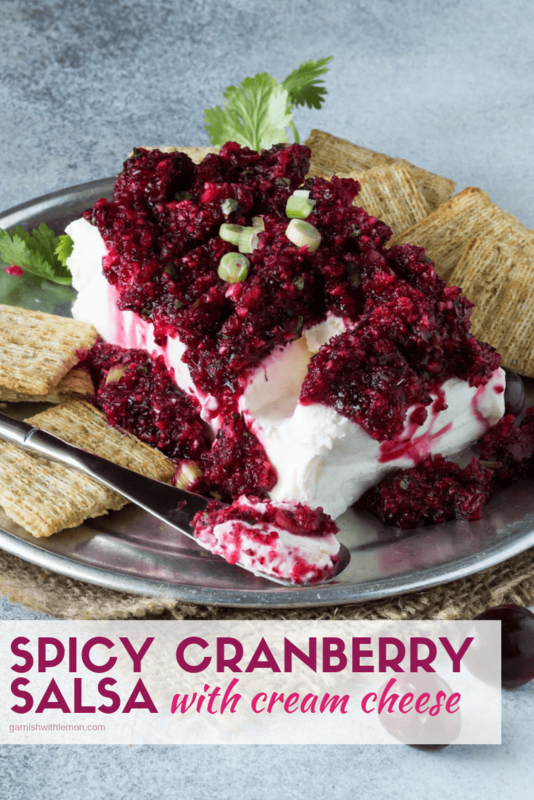 This Spicy Cranberry Salsa with Cream Cheese is a fresh spin on the traditional pepper jelly and cream cheese appetizer that I love. Add this to your holiday spread and watch it disappear. I’m always looking for new additions to our holiday party that we host each December. I have my tried and true favorites that everyone expects like the Bacon Cream Cheese Bites and this Asiago Dip . 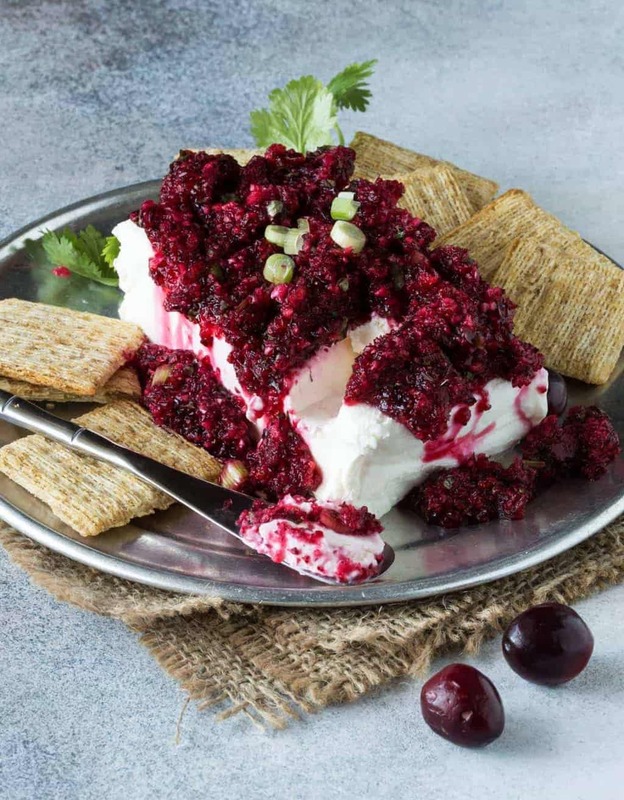 But I like to change things up a little bit and this Spicy Cranberry Salsa with Cream Cheese is simply irresistible. I love the combination of tangy fresh cranberries, spicy jalapeños and cool cream cheese. Slather it on a cracker and I can’t stop eating it. Simple, festive, and absolutely delicious. It’s your new go-to dish for the holiday season. Tip: Be sure to let the salsa chill for at least 4 hours, overnight is even better. If you try and eat it right away, your mouth will pucker. Those cranberries need to hang out in the sugar mixture to mellow their tartness. But once they do, you won’t be able to stop eating. Need more party food ideas? We’ve got a whole board dedicated to them on Pinterest. Follow us to make sure you don’t miss anything! Follow Garnish with Lemon’s board Party Food Recipes: Appetizers, Drinks and Desserts on Pinterest. This Spicy Cranberry Salsa recipe is amouthwatering addition to your holiday spread. Place cranberries in bowl of a food processor and pulse until finely chopped. Add sugar and stir to combine. Add cilantro, green onions, jalapeño, salt and the juice of one lime. Place in glass dish and refrigerate at least 4 hours or overnight. 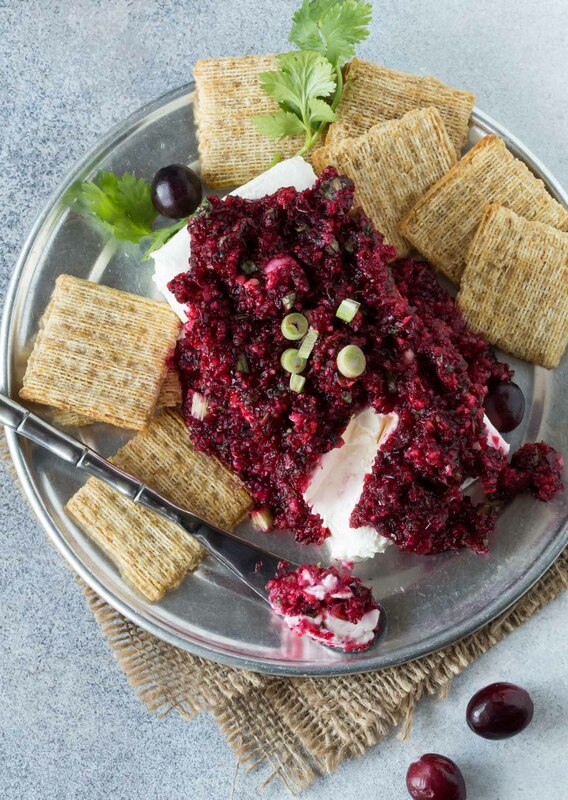 Place cream cheese on a plate and use a slotted spoon to mound the cranberry salsa on top. Serve with crackers or bread. I just made a VERY similar recipe yesterday (slightly different than yours) and can’t find where I acquired the recipe – I always like to give credit where it’s due. But just wanted to comment that your photos of this are just beautiful. I have a good close-up lens, but don’t usually take the time to use it since I have to change out my regular one. Anyway, congrats on the photos. Now I’m going to take a look at other recipes on your blog. This was so good, everyone loved it and wants the recipe. Has anybody ever froze this? I haven’t but can’t imagine why it wouldn’t work. Let me know if you try it and how it turns out! Would it be okay to make this a couole of days in advanced, minus the cream cheese? This is close to a recipe I used …but lost . I could eat it as a meal. I also add half an orange and Granny Smith apple finely diced. I also use the zest from the orange and the lime not to mention the juice from the other half of the orange and a splash of apple cider vinegar. Always have rave reviews with this recipe!